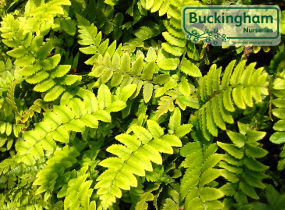 A magnificent garden fern with pale green divided fronds contrasting dramatically to the scaly golden brown midribs in spring maturing to dark green. Evergreen in sheltered positions. Tolerant of sun, and more wind resistant than many ferns. Height and spread 3ft (90cm).